The internet today is overwhelmed with tons of DIY SEO tips and tricks. What might be even worse, there are countless case studies that show how great some particular tactic worked for a single website. Overfed with countless advice making things look simple and obvious, webmasters often rely on their intuition, common sense, or gut feelings when it comes to SEO… and they often fail. What do you think is the #1 counterintuitive truth that other webmasters should know about SEO? Apparently, this question resonated with our respondents a lot because we got an unexpectedly huge number of brilliant replies. Many people we reached out to went beyond writing a short answer to our question. They willingly shared their experience and even their secrets. That is what our ‘poll’ developed into! And, I assure you, you won’t be able to find a similar collection of really actionable and truly applicable pieces of SEO advice elsewhere. And in addition to this article, for your convenience, we created an e‐book with every single awesome reply we had received. It includes 127 pieces of important, counterintuitive truths about SEO. Actually, this e‐book is a unique SEO guide with an enormous amount of practical advice in it—and no fluff. Be sure to get it here. No need to opt‐in. Just grab your copy. And now, let’s finally learn the most counterintuitive truths about SEO! A HUGE counter‐intuitive truth that I see a lot in the overlap between content marketing and SEO is that content promotion is more important than the content itself. This sounds crazy, but it is absolutely 100% true. I hear nonsense all the time like “all you need is good content” or “if you have great content nothing else matters” and my all‐time favorite one is “if you have great content links will happen.” These are false. If a tree falls in the woods and no one hears it, does it even matter? Invest the same effort or even more in distribution and promotion as that which you put into producing the content itself if you want it to be truly successful and beneficial for SEO. Most SEO’s are caught up by the idea that if they were to publish very good long‐form article content, it will be the answer to their prayers in ranking their site/page on first page and then they forget about the true essence of SEO which is all about marketing. Every webmaster should understand WHY it is essential to build quality content for their websites and realize that the content is not just about the article but the entire elements that’s seen on a particular page. Quality content is just a vessel that will serve as one asset for your website’s SEO and link acquisition campaign and SEO doesn’t stop on content creation. There’s still a LOT of things to be done. The role of SEO in digital marketing is to perform various processes in order to take full advantage of websites in terms of gaining authority, branding, and link acquisition. We should always keep in mind that Google has 200+ ranking factors to consider when highlighting a site in the first page of their search engine. The term I hear out of context that drives me crazy is “Content is King”. Many people think that content alone will help them rank #1 for their primary phrase. This is completely false for many reasons. Yes, it all begins with great content. You have to write content that is 10x — 100x better than your competition because ultimately Google is striving to provide the best consumer experience that answers search intent. But if all you do is write onsite content you are going to find it’s very difficult to rank for competitive keywords. The Internet is saturated with an absolute ton of articles. If you do not promote your content nobody is going to find it and it’s not going to rank on merit alone. You have to obtain backlinks and drive traffic to the page to get it to index and move up in the SERPS. Creating great content is the first step but then you have to promote it. You can promote content on social media (Twitter, Facebook, LinkedIn, Pinterest, Google Plus, etc. ), outreach to influencers in your niche, bloggers, get media attention, press, boost posts via Facebook, pay for social promotion, utilize an email list and more. Content isn’t King. Content is the foundation and promotion is King! The number #1 thing for me is everyone saying content is king and expecting that no work needs to be done outside of creating awesome content. The work, the hustle, still has to be done after the post is live, even with great content, so that you can attract the links, shares, social engagement and awareness to the piece which eventually leads to greater organic search traffic. Content is king, but you have to hustle for links and attention no matter how great that piece of content is. “Just create great content.” That’s one of the biggest lies sold into marketers around SEO. Unfortunately, great content isn’t enough. Great content should be a given, but there’s a lot more that goes into SEO than just that (otherwise we’d all be hitting page 1 of Google with ease). Backlinks matter. Intent‐matching matters. UX matters. Make sure you understand this before committing all of your time to just creating content you think is ‘great’. I did an experiment on one of my sites KontentMachineDiscount.com, I ranked it for the keyword “Kontent Machine” “Kontent Machine Discount” and multiple keywords around this keyword. There is no content at all on the homepage and the site is at #1 in Google from last 2 years. Same is with 2–3 of my other websites. We are ranking at top with authority backlinks. Content is not king. Not in the sense that people think it is. In truth it is just one part of the ranking puzzle. Yes, it’s probably the most important part, which is why it gets touted as king, but most people interpret this to mean: All you need to worry about is writing good content. Google is a machine and ranks your articles based on your content, but that means based on how you’ve used keywords, how you’ve used related keywords, how you’ve used rich media, titles, meta descriptions, subheadings… AND how well you’ve validated that content by sending authority signals to it. This means internal links from other parts of your website and external links from other websites. It also looks at how your content performs with users, do they read it all? Do they share it? So next time you read that content is king… take it with a bit of context. Why is it king, and what about it gives it that power? I know, it would be much easier if Google would just read our stuff and gaffaw over how good it is, but we’ve got to help it get there. Great content alone won’t get you to the first page of Google for truly competitive keywords. You have to strategically promote your content to sites that would be interested in it. This promotion will earn you high‐quality links that ultimately boost your rankings. Writing more and more “great content” won’t get you traffic by itself. You’ve got to promote that content in as many channels as possible. Kept it short and sweet if it works — great. I think it’s “Content is King”. It’s a gross overstatement of the importance of content in SEO. Yes content is foundational in the sense that without it, there’s nothing to rank. But it’s not the end‐all of things. On site optimization has grown in importance but it also has been segmented to so many factors. If keywords and content were huge before, now they’re basically just part of TF*IDF, co‐citation, co‐occurrence, site speed, security, TTFB and all these other factors that make modern SEO what it is today. Content is important but it’s not king. Know all of the factors. Check the survey results that Moz puts out there in terms of the current weight of numerous ranking factors of today. Content is without a doubt one of the most counter‐intuitive SEO truths we should understand. There is this misguided feel out there that churning out content by the truckload is the way to go. Misguided, because a part of that statement does not ring true. It is true that fresh and regular content will help get you where you want. However, what most of us don’t know is that this content needs to be extremely high quality. It means you’d rather spend a lot of time penning few quality pieces than write a ton of content that does not cut it. Again, while great content is a good starting point, it is not enough to get you to the home plate. You will need to optimize and promote these pieces heavily to direct traffic to your online platforms. Personally, I started with my social media networks. I created quality content and engaged my followers positively, making sure that I touched aspects of their daily existence that others in the industry had given a wide berth. Instead of creating content, a lot of websites should be focused on cleaning content. This requires a full scale content audit crosswalked with SEO metrics like organic entries, on site engagement and inbound links data. From there, you should be able to determine if you should delete, update or 301 each page on your site. Aside from that, I just wish our industry stopped reading blogs and started taking more action. There’s many theorists and not enough practitioners, it’s rotting this industry from the inside out. Most of the crawlable pages are non‐indexable, canonicalized, redirected, error pages then they will just be wasting the crawl budget of the site, likely making more difficult to find the indexable ones meant to be ranked. The indexable pages are of thin and/or duplicate content, that will end‐up cannibalizing with each other, ranking poorly, providing a bad user experience and likely being caught at some point by Panda or Phantom. Myth: You need to create content on a regular basis to rank batter. I hear this myth quite often. Yes, while a website that has more pages does tend to get more traffic, it is not necessary to rank well. My website (digitalux.co) was ranking for the keyword “digital marketing company” when it had only 30–40 pages on it. Other websites ranking for that exact same keyword had hundreds or thousands of pages. The quality of the content and the quality/relevancy of the backlinks going to that content is much more important than the amount of content on the site. We fell into this trap early in this year and quickly decided to switch our focus to making one or two big content assets. We created one infographic and a slide deck on a study we did using our lead validation system. Then instead of using our time writing new blog articles we used it to show off our work/pitch it to other websites and have received 100+ referring domains linking to our content. Still months after creating these two pieces they are still bringing in 10–20 links a month per asset. Our rankings and leads have greatly increased because of it. I think one of the great SEO myths is every site should have a blog. I have seen sites invest in filling passionless blogs with content to feed the SEO machine. But if an organization can’t commit to building out compelling content that visitors actually care about, its marketing team should consider building out evergreen content, such as guides. For example, I had a client once who did tourism marketing in a really popular city in the U.S. They read about the importance of a blog and had interns writing posts, but not one of them ever had any traction. They each got a handful of social shares (mostly from employees), and they didn’t engender much organic search as well. But their competitors were eating their lunch with evergreen guides on things like “X Free Date Night Ideas in [Popular City]”, “X Great Things to Do with Young Children in [Popular City]”, etc. So if a site can’t invest in a blog, I highly recommend starting off with building out resources their target audience would care about, want to share on social media, and want to link to. One of the main counter‐intuitive truths about SEO is that more articles will result in more traffic. Often times, people take the “if you write it, they will come” approach and this simply isn’t true. Instead, you should focus on creating content that is very comprehensive and then share that content through outreach. This additional outreach will get people to view the content, but will also get you backlinks which is the main factor in website ranking. I think for me a myth I’d like to expose is that all you need to perform organically is to produce good content. You hear a lot of hot air about content, why it’s important, why brands need to be producing it etc, but not a lot of context about measuring impact. We see many brands pumping out huge quantities of content daily, but not many seem to be asking why they are doing this or attempting any kind of measurement at all. Often, simple technical fixes or adjustments to websites can have a huge impact to organic traffic, much more than simply publishing another 10 blog posts that no‐one is reading or sharing. This is why I want to fly the flag for internal linking specifically, to underline its importance and power. For me internal linking is one of the most undervalued aspects of SEO, with many sites having inefficient menus and/or poor site structures. If the industry took a little less interest in the ‘content’ myth and more in the actual mechanics and workings of their own websites, it would probably be in a much stronger place! Many beginner bloggers and webmasters think that they need to churn out lots of content on a regular basis. But the truth is that quality will always trump quantity. Rather than writing content for content’s sake, focus on improving your existing pages and creating new articles that go in‐depth to answer questions that no one else is answering. I rarely write new blog posts, but through use of the Content Upcycle Method I’ve focused on improving the content that is already performing the best. This tactic generated more than $4,700 from a single blog post in a single month and I’m on track to beat that record this year. In a modern SEO world where the word ‘content’ is banded about on a daily basis by SEOs, there has been a move to create as much content as possible in a bid to win the ‘content war’. In reality more content can end up actually harming your site, bloating it out with non‐targeted pages and wasting valuable crawl budget so Google spends less time on the pages that provide your audience with the most value. The best way to get around this is to refocus your content creation activities to focus more on producing much higher quality content with even more value to your audience. If you are currently producing five articles a week that get less than 100 visits each, try creating a single keyword‐targeted article each week, with more research and more value to your audience, and then actively promote this article to key influencers in your industry. You’ll find this reaps much better rewards for your efforts than the five articles a week. The concept of quality over quantity is still as prevalent as ever today. The number one counter‐intuitive truth about SEO is that getting rid of dead weight on your website will help you boost traffic. There have been countless of case studies about the effects of content audits but people still don’t seem to be catching on to it. We’ve seen amazing results across many sites from deleting hundreds of low quality articles, empty pages from years back that never attracted any links, social signals or even readers! If you don’t have any of the latter on an article, there can literally be zero harm to your site and it’s better for you to delete them and redirect to a more relevant source. Often times you’ll find that consolidating some of these old articles can easily lead to a killer piece of “skyscraper content” that takes off. A good example comes from one of our forum answers about which are the best website builders for SEO. Initially this started off as a quick recap of an earlier article we had written about website builders. But, after watching the organic search traffic coming from Google we decided to update it… several times. Now it boasts tables of data ranking website builders across a range of SEO related metrics, it talks about on‐page features, content creation, links to additional SEO resources, how to get started creating a websites, what great tools there are to test their site’s SEO, example of fantastic SEO design, and more. As the page has grown, so has the rankings it captures in Google – faster than fresh content would. 99% of people don’t need any fancy tools or tactics. They just need to write the best content online for the topic they want to go after. There’s no need to get backlinks, carefully structure the article, etc. Google is smarter than that now. Just focus on writing the best answer to whatever search query you’re going after, and if you did that, you’ll gain the rank in time. That’s all I’ve ever done, and I get ~10,000 visitors a day from Google. RankBrain can interpret a user search to find pages that might not even contain the search keyword. It’s judging a site and article based on quality, depth of answer, overall reputation of the site, etc. Honestly, at this point we really don’t even know all the possible ranking factors involved but the depth of analysis that RankBrain brings is going to be staggering. Just like the early days of the microprocessor, the intelligence of AI is growing exponentially every few months. In a couple years who knows what’s possible. So as far as today is concerned, how do you get ready? The answer lies in putting writing quality above all else. Don’t try and stuff keywords where they don’t belong. Yes, still focus on keywords, but your north star for everything you write should be the user. AI will actually make the Internet a better place — spammy sites will start to disappear as they become more irrelevant. “Content factories” will become less profitable. If you want to understand where Google is headed, get yourself a Google Home. Start playing with it and see how AI is changing everything. It may seem counter‐intuitive, but Google is tightening its organic results for 3rdparty websites and trying to respond to the good amount of searches by itself. I mean you try searching for the election date, it will not encourage you to go to 3rdparty websites. Instead, it will answer you the date right on the Google screen only. There is no point of creating a calculator to attract your potential visitor because Google has an amazing calculator right in the search results. You type in math, and it will answer you in microseconds. Rand Fishkin said in his presentation at Mozcon 2016 that 40% of all searches result in no clicks (Google answering them). We had to shorten Moosa’s great advice a bit. But you can find its full version here. A counter‐intuitive belief that many SEOs hold is that “PageRank” is dead. In fact, PageRank has changed, but it is far from dead. In the old days (say pre‐2009) PageRank was a MAJOR ranking signal, and SEOs did everything they could to game it. Later, several developments occurred that led marketers to pay far less attention to PageRank. Google’s algorithm became much more complex. As a result, PageRank became a less significant ranking factor. As a result, it became harder to influence search results through PageRank alone. In 2009, Google dealt a blow to “PageRank sculpting” by changing how PageRank was distributed through nofollow links. Finally, in 2016 Google killed the PageRank score shown in toolbars and browsers. This was fine, as they hadn’t updated this public‐facing score in years. The real PageRank–the score actually used to rank webpages–was still being calculated behind the scenes. Unfortunately, by this time nobody cared anymore. Everyone had learned by now that “PageRank” is dead. It became–and still is–a social taboo for SEOs to even mention PageRank in polite circles. It’s true that the influence of straight PageRank isn’t what it used to be and it’s much harder to game. In fact, Google reps have more than once mentioned many types of low‐quality or off‐topic links that don’t pass any PageRank at all. On the other hand, PageRank variations can be used by many parts of Google’s algorithm, including Topic PageRank and Entity Salience, to name a couple. If a link is good, relevant, and editorially earned, it likely passes PageRank, and possibly more than one type of PageRank. Understanding and recognizing how PageRank flows can make a difference in your SEO campaigns. The difference in many cases will be small, but in a competitive environment, every advantage counts. Beyond PageRank, another mistake I see folks make is assuming that links pass value equally. A link is a link is a link, right? (no, no, and no). We’ve known for 10 years that this isn’t the case, yet folks forget all the time or act as if it doesn’t matter. Your keyword rankings do not exist in real life. In other words, no actual human sees your website as it appears in an incognito mode, non‐localized, non‐device setting with no previous search history SERP. It’s purely a construct of SEOs. A rankings report is a diagnostic indicator. It is not a key performance indicator. That said — a rankings report is still incredibly useful. You should use rankings data from Ahrefs, Search Console, and manual SERP checks to try an idea of what might be happening in the SERPs and to inform what you should do next. Most webmasters believe Google crawls their website in one go and will continue until everything’s crawled. After all, that intuitively seems the best approach. However, it’s far from the truth. Google’s crawling of any website is a fragmented affair, spread out over many visits in a given time period, with some URLs crawled very often and others rarely at all. Understanding how Google’s crawlers interact with your website is a fundamental principle of technical SEO. The truth about SEO is that for 99% of businesses, it’s not a great marketing tactic. The problem isn’t that it couldn’t generate results. But other methods are much more consistently effective for almost all companies. Sure, SEO is ‘free,’ and it’s good to handle the basics of it, which is usually enough to generate moderate results, too. But investing a lot of time into it is generally a mistake—although, for 1 in a 1,000,000 it pays off nicely, and they’re the case studies you find everywhere. The #1 lingering SEO myth we see at the moment is that SEO exists in some kind of magical silo where all other marketing activities can be ignored. Really, this is not the right way to think about things and whilst social signals may not directly influence SEO being active on social media can help build relationships that in turn can lead to opportunities that do influence your SEO. This is of true of social as it is of PPC and content marketing and all these activities should work together with SEO at the forefront to create an SEO smart digital marketing plan. Ultimately do great marketing and figure out how to integrate that with your SEO efforts and it’s win win. Another common myth we come across is that Google is now so clever that the foundation elements and good technical SEO simply don’t matter any longer. That’s just not the case and only this week we worked with a UK company who saw their homepage disappear due to issues with HTTP / HTTPS and misconfigured canonical URLs. We also recently worked with a charity (pro bono of course) who lost 90% of their traffic after a seriously botched website redesign. As the web gets more complex and sites get bigger and older technical SEO is more important than ever — Google is not always as smart as should be! It’s counterintuitive to think that SEO should drive your brand and content strategies because it shouldn’t. Instead, you should focus on building out your brand and content strategies around unique, differentiating core values that help you stand out. From there, you will be able to then identify the type of keywords and search terms that reflect those values. If you only focused on SEO and used that as the foundation for your content strategy, it would lack the engaging level of advice and information necessary to attract your audience after they found you through a search term online. It’s not just about getting them to your website; it’s about keeping them there. SEO no longer exists as a standalone strategy to gain more visibility in search. It can only be successful when viewed as a part of a bigger, more holistic approach to marketing where content, social media, networking, community building — overall online visibility, in other words — are completely interconnected and interdependent. Focusing on SEO alone, without integrating the whole kit and kaboodle, will yield mediocre results at best. One of the biggest SEO myths I hear on a regular basis is that you can “SEO your way” to top rankings and organic traffic growth with simple onsite optimizations alone. Sure, tweaking title tags, optimizing existing copy across key pages, addressing technical issues, etc are all important fundamental SEO tasks, and executing on them can deliver some short‐term results. But those inputs alone aren’t going to consistently grow organic traffic long term. The only way to see sustained, exponential, organic traffic growth in competitive niches is with content marketing. SEO IS content marketing now, and content is the single biggest engine for month‐over‐month organic traffic growth. So if your SEO strategy doesn’t involve publishing a portfolio of strategic, value‐driven content assets on a regular basis, then you’re not doing SEO properly and you’re not going to see optimum growth. Let’s say the meta keywords tag was some huge ranking boost if you did it just right. Well if you knew that trick & did it then you could use it to make $x or have outcome y, but if you specifically shared the tip to a bunch of SEOs then many would emulate it & then the relevancy algorithms would adjust or Google engineers might step in to whack some people who were leveraging the approach. 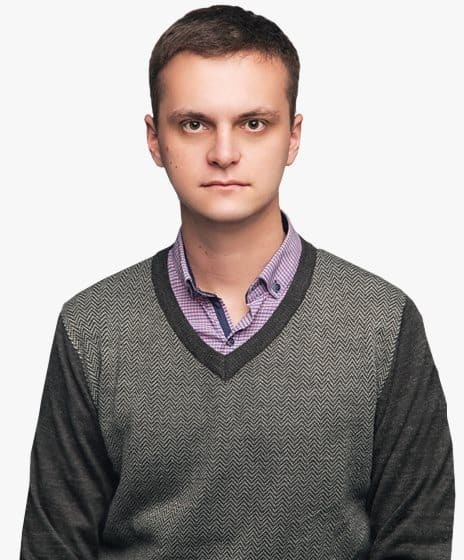 In an online information market controlled by a monopoly (with many friendly water carriers) there is little incentive to share specific information about a precise example of where consensus thinking is wrong, because it may only be the lack of belief in something which allows it to remain true. I am not really active in SEO like I was for many years, but there were (and surely still are) many areas where consensus perspective is wrong, but it can cost a lot of time and money to find some of them, and then if someone unequivocally proved their case, they might immediately make it untrue. There was a (rather long!) period of time where the SEO industry operated like a meritocracy. It no longer does. Which is perhaps part of the reason some of the brilliant & passionate bloggers from years gone by (like John Andrews) don’t blog much anymore. It sort of makes you wonder if they believe what they wrote at both points in time. If they did, then it makes you wonder if they care about the longterm health of their clients. If they do, then hopefully (for the sake of their clients) whatever they are selling clients today won’t be something they choose to write up as being an overt form of spam a year from now. I think it’s true that Google has gotten better at crawling the most amateurly created sites, or even the newest AJAX and dynamic frameworks, but that doesn’t mean technical SEO is dead. It’s my belief that since Google has improved its crawlability, it makes having an optimized hierarchy and clickstream even more important – because Google can see a flawed site with better focus. In the last couple years, I’ve seen a resurgence of technical SEO needs. We’ve done great things with just technical work, and have seen traffic and revenue improvements correlating positively with the technical work. This includes optimizing for bots and load, managing index bloat, speed, and so on. Stop jumping into the link building bandwagon if your website isn’t really optimized to bring in the best results. By simply being prepared, you cut the waiting time and get rankings/results much, much earlier versus just link building alone. We spend so much time focused on what’s new in search or what the future will hold, it’s good to remember sometimes that the past is equally as important. That applies to links acquired in the past that could become a problem. As well as previous iterations of a site that may have resulted in stacked redirects, lost equity, 404 errors, outdated site maps and architectural considerations that should be evaluated regularly. While it’s important to stay current and be proactive based on where search is going, we can’t neglect history. According to me, the #1 counter‐intuitive truth that other webmasters should know about SEO is: Technical SEO – More specifically, website load time and content delivery. I have seen many webmaster don’t consider this fact while developing & hosting the website. No matter how big / small is your website is; but by considering this fact, you can not only gain better organic SE ranks but also can decrease the bounce rate. Google has clearly mentioned these points in official webmaster guidelines. I’m involved in dozens of redesigns and new site launches for some of the biggest brands every year so I have a distinct pleasure of working with many webmasters and developers from top agencies. By far, the number one counter‐intuitive truth about SEO they should know is that meta keywords element on the webpage doesn’t matter at all for SEO rankings. Google, and other search engines, totally ignore it so my advice is to leave it blank. It wouldn’t hurt to add a few targeted keywords, but why would you make this information public for your competitors to see and reverse engineer on their sites? Overoptimizing meta keywords tag can look outright spammy to the spiders, so I’d just retire this tag altogether and cross it out from any tech SEO checklist. A canonical tag is merely a Band‐Aid, as it mainly only addresses Google (versus other search engines), and doesn’t address bookmarks, social shares, link destinations and so on like a redirect would help. Until you know how to properly use them, adding tags and categories to your WordPress posts can do a lot more harm to your SEO than good. First, each new category and tag creates a new archive, which is indexed by default. If you create several new tags for each post, like many newer bloggers do, you’ll pollute Google’s search index with dozens of thin and low value URLS. After all, each one will only contain one post or post excerpt, which means they don’t provide any new value that you can’t find in the original blog post. Once Google encounters too many URLs like this, your crawl rate will suffer, which will damage your entire site’s ranking in a variety of ways. If you do manage to use every tag and category on at least a few different posts, you can still run into keyword cannibalization. If you have two tags or categories that are close matches, like “fashion design” and “clothing designs”, both archives could compete for the same traffic and neither will effectively rank. It’s even easier to have one category and one tag that compete for the same keywords, or one archive and one static page. Finally, if you don’t add any supplementary content to your archives (like descriptions and links to your relevant cornerstone content), then you’re wasting them. The PageRank from your blog posts’ links will still flow through your archives to your newest blog posts, which is good, but the archives are less likely to be used by real users, which also means they’re less likely to ever earn organic links. By not linking out to relevant cornerstone content, you’re making your archives less useful for real readers, denying views to your best content, and missing out on passing some strong PageRank and relevancy signals. The counter‐intuitive truth is that as much as you will want to, the more time you spend reviewing analytics & Search console & then checking off all the million little check boxes of “perfect onsite SEO” the longer it will take for you to do what REALLY moves the needle: building links. I am by no means advocating an abdication of solid on‐page SEO, and preventing “shoot yourself in the foot” errors like leaving a disallow in your Robots.txt but putting a “how to we promote this” mentality into your core planning and creation process. While there may be a lot more traffic for one keyword phrase vs another keyword phrase, you are never going to harvest that traffic unless you also put mind into how you’re going to get links and awareness of that page/resource out there. The less you chase SEO, the more it seems to be effective. For example, NicheHacks and its writers has never been big on SEO, PBN’s and whatever else people spend their time and money on. Instead, we outreach and tackle down sites that are already big and popular in our space. By doing this, we get more shares, links and attention from big named bloggers. We focus on creating epic content, content that is bigger and better than what’s already out there. By doing this, we get more traffic from Google than any other source. Forget SEO, focus on epic content and reaching out to big named bloggers and you’ll eventually get lots of attention from Google. Webmasters must aggressively promote each piece of content they publish with pre‐ and post‐ outreach. It’s counter‐intuitive because a common assumption is that if you write a 2,000 to 3,000-word blog post, you will somehow get a spike in organic search traffic. Not true. Your “epic” article, video or infographic must be promoted far and wide if you wish to rank for even low competition long‐tail keywords in 2017. #1 — Run your competitors’ article URLs through Ahrefs’ Site Explorer Backlinks or Batch Analysis feature. #2 — Export your backlink results to a CSV file. #3 — Get the first name and email address for the webmaster or blogger of each unique domain name in your backlink results. #4 — Email the site owner about your new article before you publish it. Link building nowadays is all about link earning. If you’re starting from scratch, which means that you don’t have a network to help you out (just a few friends offline) or you don’t have an online influence (no email list, social following, etc..) or you don’t have an established authority at the first place – you’re the small guy competing with online giants in your space, link earning isn’t the good start for you. Link acquisition as you are building up your authority requires intentional link building that includes finding list of targeted link prospects and reaching out to them for link requests or content sharing. That is why there are still a lot of agencies who offer manual and professional link building services to help startups and old companies that don’t have much authority/influence and groundwork to earn trust and links from publishers/content creators. See Venchito’s full recommendation in our e‐book. While the concept of link building is extremely important, far too many people still think it’s about the number of links versus their quality and value. For example, one quality backlink on an authority site can be worth the same as 100‑1000+ backlinks from a wide range of lower quality (DA/PA) sites. At the same time, it’s also important to focus on the relevancy of your backlinks and content as well. These are all key factors that Google will look at when ranking your site. Should you stay consistent with your high‐quality backlinks and keeping them relevant, you should see much faster movement against the competition. More links doesn’t mean better rankings. I see a lot of webmasters wonder about this one competitor with very few links that outranks them. Are they hiding their links? Are their few links of a very high DA/PA? This other mutual competitor has ten times unique domain links and it still doesn’t rank better than them. Not all links are equal. For years now Google’s been able to differentiate link types by their location on the page, context, relevance and many other factors (e.g. image links). Links contained within boilerplate elements / templates are quite easy to detect and are treated differently than those provided within editorial context. Additionally, these PageRank simulation metrics by various tools (TrustFlow / DA / PA…etc) are just that — simulations. These metrics are not a true representation of page authority as seen by Google, but instead are based on calculations within the tool’s own index which is much smaller than Google’s index. This leads to accuracy problems. Finally, Google can do better than “general authority” of a page. It understands page topic very well and it may treat a page very differently on its core topic than something that’s seen as marginally relevant to the page’s content. In other words same links from same pages can have different value as they are context dependent. Lastly, there isn’t much point attributing your competitors’ success to a number of links or linking domains. Why? Well, you just don’t know what’s in their disavow file! One interesting activity I see is companies buying alternative domains with important generic search phrases and pointing them to their sites, believing that it will give them a ranking boost. Unless you are building a real site with real backlinks to that domain, I see zero benefit to this activity, other than keeping a future competitor from owning the domain. In recent months we’ve been spending a lot of time and money acquiring links from places like Forbes, Entrepreneur, New York Times, etc. While it would be tempting to believe (and understandable) that you’d get a nice ranking boost from world‐class links like these, more often than not, it doesn’t happen. In fact, I see much greater spikes from sites 1/100th their size. I don’t doubt that these big links contribute to the big picture in your link profile, and that they are good to have, but when I am hunting, I am chasing links with less than half the DR/TF/CF/DA that these guys have as they return much greater bang for buck. More specifically, I am getting the biggest push from sites that closely match my top ranking competitors or niches TTF, assuming all other metrics are strong. Some techniques may be outdated and some others should never be used, but a correct link building strategy will bring results. It may be time‐consuming, but it may also be rewarding, as links are still an important ranking factor. A very important thing to remember: link building should always be based on solid, high‐quality content. Linkbuilding is still very much alive, but it looks very different than it did 5 years ago. Mentions is the new currency. Linked or unlinked mentions of your brand name & sub brands are just as valuable as classic backlinks, which speaks to the importance of having a holistic brand building and content marketing strategy based on consistent, long‐term quality over quick wins. It’s as much branding, reputation, and content marketing as it is linkbuilding. Links have value even if they are never clicked. That’s the strangest thing about SEO. I often give presentations and teach people about search. Often these people are PR professionals. When I explain links, it makes sense to them. But when I explain all the possible places where a link may pass value, they get confused. “But our target audience isn’t on those websites” Yes, but that doesn’t mean there isn’t search value for being mentioned there. I am absolutely not recommending seeking press, links and mentions from irrelevant sites. Link spam is bad. And good links are amazing. …but it’s strange to be that something can have value in search (maybe a lot of value!) even if it meets none of those other criteria. I believe that in the midst of all the myths surrounding SEO and its operations (like link building is dead, high rankings is a must, you should check your meta tags, social activity, and engagement does not affect, SEO, etc.) I believe that the most dangerous ones related to the notion that good content does not count so much in comparison to a good SEO manipulation of the site/page and that effective SEO should be divided between off‐page & on‐page activities (actually research found that effective SEO is 75% off‐page and 25% on‐page). In any case, SEO should always be matched a good high‐quality content and quality links in order to provide its best results. SEO success is still tied to link building as a way to give search engines confidence to list a site on the search engine’s result page. Quality links are the key these days. It makes better sense for webmasters to spend more time getting fewer quality links, than it does getting a high number from unrelated sources that don’t have much page authority. The #1 counter‐intuitive truth I’ve come across is the belief that you have to build links to a page to rank it. Authority sculpting, which is the method of channeling link juice from link baits on your website to pages that you want to rank for, still works beautifully. For example, if I’d like to rank for ‘buy kitten socks online’, you can very well create some great content related to the pet clothing niche and internally link to your kitten socks product page. This is also the exact nifty strategy ecommerce marketers use to rank their product pages. In fact, this is the most legitimate and straightforward strategy you can use to rank your ecommerce product pages without breaking Google’s guidelines. Neil Patel has a great guide on this, and you can notice a great many examples of blogs doing this to rank their internal pages for money keywords. One out‐dated belief is that forum links are worthless. I still contend that links to product pages from forums and user groups are very worthwhile in terms of sending qualified (converting) traffic. Cited here and here, I show you where there are sales to be made from strategically placed links in forums. This works especially well for eCommerce and subscription based websites. There is always a risk with obtaining links from any source, but the majority of risk here is on the community managers banishing you from participating in their forum for commercializing the discussion. There is a way to get this done without tripping any alarms and that is to use a rubric or matrix like I illustrate in these articles. The counter‐intuitive truth is that MOST of the columnists will admonish this method because Google informed them that “forum links are bad”. The reality of it is they have little or no experience competitively ranking sites, nor improving a conversion rate of a site. #1 counter‐intuitive truth that other webmasters should know about SEO is that blog comments are great ways to get backlinks. Now I don’t mean dropping a URL into a comment box or adding keyword‐rich anchor text linking to your site on a blog with no contextual relevance, because that will get Google’s attention real quick. However, 400 – 500 word blog comments that provide additional value to the author’s original post or supplement readers with more information can be highly beneficial. Not only is it a great way to earn a backlink, but others will see you as THE AUTHORITY, increasing your own chances of being a guest contributor on another blog (and even more backlink opportunities) or organically sharing your link from the comment. It’s not exactly a myth, but many SEO’s have an incorrect perspective on Google’s link guidelines. Let’s face it – it can be very difficult to attract natural, editorial links in a way that complies with Google’s link guidelines. Many SEO’s and webmasters want something easier, so they start to believe that Google doesn’t really mean what they say, or that Google won’t enforce it. I’ve heard webmasters brush off Google’s link guidelines by suggesting that Google doesn’t really object to paid links as long as they’re not part of a network, or that Google doesn’t object to a blog network as long as it has unique, relevant content. While Google is far from perfect at enforcing their link guidelines, the past four years have proven that Google can and will take action against webmasters who violate them. If you understand the risks and want to use tactics that are outside of Google’s guidelines, just be sure you start with an accurate understanding of what Google’s guidelines and intentions are. Perception is reality: you need links or great content to rank. If either of the two are fine, ranking for competitive keywords in certain markets is still as easy as it used to be. Google is really driven by user signals, so as long as you make people happy, Google will show your site too. In my experience, the most counter‐intuitive truth about SEO is that at the end of the day what web crawlers find when they crawl from and to your landing page is less important than what long‐term user signals show them. Signals to pay attention to for the webmaster specifically may include: mobile PageSpeed and friendliness, bounce rates, conversion rates, click events (what should be emphasized, what can go away), and number of HTTP requests. Marking up content has also helped with greater visibility in carousels and Rich Cards within search results; therefore, markup everything. Tools we use quite a bit include Google PageSpeed Testing Tool, Pingdom Speed Test, Structured Data Testing Tool, Mobile‐Friendliness Testing Tool and the AMP Validator. View how these changes are seen by Google within Google Search Console. Revisit and monitor weekly. Better usability is always better for the business. I do believe this is true for 99% of all businesses, but sometimes, making things easier for the customer can actually reduce sales. This is especially true for businesses that benefit from greater page views and/or the exploring of the website. If the customer gets what they need right away, they have no need to explore further. That could mean lower profits as less exploring reduces sales or ad revenue. That said, I would never pursue a course of making your site more difficult to use. Satisfy your customers first and then look for ways to improve sales. I believe the #1 counter‐intuitive truth about SEO is that Google can and should be “gamed.” When I first started optimizing websites in 1996, I was able to rank for a keyword simply by adding it to the META Keyword Description. Google changed the game with BackRub & PageRank in 1998, and has evolved significantly since then. The biggest myth I’ve had to dispel over the years, is that SEO professionals are at odds with designers, developers and copywriters. With Penguin moving to becoming an integrated component of the search algorithm, the last bastion of black and grey hat SEOs are looking for work. Google is simply chasing a good user experience, which means competent designers, developers and copywriters will be rewarded for doing their job vs. acquiescing to outdated SEO rules about keyword‐stuffing and junk links. From Google: The goal of many of our ranking changes is to help searchers find sites that provide a great user experience and fulfill their information needs. We also want the “good guys” making great sites for users, not just algorithms, to see their effort rewarded… We want people doing white hat search engine optimization (or even no search engine optimization at all) to be free to focus on creating amazing, compelling web sites. I believe the notion that backlinks are the end‐all, be‐all, must‐have for earning high rankings is becoming a thing of the past. As I wrote in a recent post, user experience (high engagement levels) is on its way to becoming the key to high rankings. Many of my recent posts are getting served on the first page SERP without any backlinks. The thing that I hear from a lot of people is that, somehow, Google and SEOs are on opposite sides — that Google wants to stop SEOs and that SEOs need to “game the system” to get results from Google. In reality, you can work with Google — by working on delivering what they really want. They really want content that is helpful to actual human beings (not keyword‐stuffed content with good user experience), they want technical optimizations that tell Google what’s more important and how things on your site relate to each other (on‐page SEO), they want quality links pointing to your pages that are natural, contextual, and helpful because that’s what builds the web and conveys authority (build links by writing or doing something worth linking to). Google’s end game is to provide the most relevant results to real human beings. If you’re aligned with them by creating the most relevant content, taking the time to organize your site correctly, and establishing trust and authority online, then you will dominate in the search results. If you aren’t aligned, and you’re trying to find the “loophole” instead of providing great information, then it’s only a matter of time before that loophole is found, closed, and hurts your business — or worse, your client’s business. Win the game by knowing the rules and playing better — not by seeing how much you can get away with. You can no longer write for robots and win at SEO. Well written, informative, and useful content now wins every time. Write for humans and the robots will reward you with rankings. Most companies that we work with greatly under‐estimate the power of tuning the content on the pages of their sites. Years ago many companies tried out a concept they thought of as “SEO text”, and this was the practice of adding text at the bottom of a commerce page purely for SEO purposes. Well, that actually WAS a bad idea, as the overall user experience wasn’t part of the equation for companies that approached things this way. That said, what DOES work, is the careful adding of content that enhances the user experience on a page. For example, imagine you have a page selling oil filters, and consider someone that comes to your page from a search engine. What are they looking for? Well, some of them are looking for oil filters, but they have many other potential needs too. For example, they need access to owners manuals to make sure they are getting the right filter, they might need oil, and they might need an oil filter wrench. There are many other potential needs, such as a how to video, or other products they may want to update at the same time, such as air filters and windshield wipers. What would happen if you gave ways for users on your oil filters page to address all these other potential needs? Part of this could be via on‐page content in a mini‐guide, and part of that would be via relevant links to other pages that address some of these other needs. In our experience, this can be very, very good for SEO. In one test, we saw a 68% lift in traffic! The most counter‐intuitive truth about SEO is that contrary to the name, it’s not about search engines. SEO is all about making better content and more accurate information for people. A webmaster’s target when doing SEO should always be the recipient of the information on a search engine. That means the people who are using the search engine are the most important to think about when doing SEO. I think the #1 counter‐intuitive truth about SEO is that you have to stop writing for Google and start writing for people who use Google. Many webmasters spend too much time trying to create the perfect SEO‐friendly descriptions and titles without making sure the description answers the real questions people are asking. The internal questions search users are asking are questions like “Can you help me?” and “Is your answer one I can trust?” so write with that in mind. Too many of us approach SEO like the Wizard of Oz—with fear, intimidation and an overblown need to please. In reality, when the curtains are pulled back, SEO is simply about people. Is SEO important, even intricate? Yes, but if you produce content with the goal of connecting with real people, you’ve already got an excellent handle on SEO. So then there’s the click‐through rate. There have been tests throughout the years to decide whether click‐through rate makes a difference in ranking, although the results swing back and forth. Rand Fishkin of Moz published a case study in 2014, for example, where he concluded that they probably did. Search Engine Land published another in 2015 saying they probably didn’t. And now there are studies about how RankBrain may manipulate results based on click‐through. However, it seems pretty obvious to me. You have your key terms (long‐tail or short tail) that call out to the searcher. The searcher clicks through to your #7 ranking site rather than the top 3. They find what they need and stop there — the site will start rising in the ranks. Is it specifically because of key terms? No. Is it specifically because of click‐through rate? Probably not. It could be because an increased click‐through brings increased back links from satisfied searchers. But SEO isn’t, and has never been, a one‐off thing. It’s a bunch of actions combined to create optimized results. The most important thing all “webmasters” should keep in mind when it comes to SEO is that Google (and all other search engines) are a business also. They make money by the occasional click on an ad mixed in on a page filled with relevant content the searcher (their customer) is looking for. They need to assure the best user experience and thus trickery will not prevail. Search engines crawl your site rapidly and store that information, which ultimately determines your placement in search. Your job is to make it easy for the search engines to crawl your site. Is the page load speed fast? Are the links accurate and using good anchor text? Is it a user‐friendly experience (pop‐ups beware)? Is the URL descriptive with keywords that match the content? Is the site secure with and SSL certificate? These are just a few of the questions you need to answer to make sure your site is optimized for search. Spend time on these things versus trying to game or trick the search engine to drive traffic that will just bounce and punish your website in the long run. Also, remember that while design is important for your visitor’s experience, structure will determine if you receive visitors. Concentrate on creating great content that is highly shareable and others would like to link back to — that’s what search engines want to see and you’ll be rewarded for. Before you publish anything, ask yourself: “Will someone share this and would someone like to reference this by linking back?” If you can’t say yes, don’t hit publish. When we write a post here at Social Quant, we make sure that it either addresses a question not being answered but is frequently asked, is an original thought on a popular current topic, discusses a polarizing topic with an original view or presents internal data we’ve gathered that others will find unique and useful. In summary, focus on your website structure and producing good content. Google will reward your business, because it rewards their business! You can win big with duplicate content, especially for websites with a large product range. Let’s imagine you’re in the Antique furniture world and you’re selling a “wooden wardrobe” from the late 19th Century. If we investigate further we can see that it’s from the Victorian era, the wood is pine and it was made in Britain. It’s a rare and desirable wardrobe that has the potential to sell quickly and you’ll want it to be seen by as many people as possible. To make sure it gets enough eyeballs, this product could feature a short snippet of duplicate content (describing what it is) on several pages including the “antique pine wardrobes”, “Victorian wardrobes”, “British antique furniture” and even “Victorian pine wardrobes” pages. “Victorian pine wardrobes” as a single keyword has 70 UK Google searches a month and that’s not including other related longtail variations. Each page would serve a different purpose and will help a differing searcher intent, so this is the type of things Google will love, assuming you have a large enough product range. By winning big, this is when you use only a small amount of internal duplicate content, that actually provides a better user experience when a searcher lands on your site from a search engine. I use a combination of these 60 link building tactics to acquire links naturally. It helps me to build an online brand by providing value to the end user first. Then the site that I am outreaching for can earn links because the content sells itself. It’s the most natural way and it is what Google wants. The strategy that I’m going to suggest isn’t new or forgotten, but it isn’t prioritised as much as it should be. If you are doing white‐hat SEO to build a brand online, then webmasters need to adopt a content‐driven strategy that will deliver value to their site’s visitors. As long as they get the content right, half the battle is won. Then they can easily leverage tools like Ahrefs to earn their links naturally. You Need to Rank #1. This is probably one of the biggest misconceptions of SEO. SEO is not about ranking number 1 for certain keywords, SEO is about increasing your organic traffic. People that get crazy about getting the first spot in the SERPs for a few keywords ignore the power of long‐tail keywords, and risk being penalized by search engines. In 2012, Google set the over‐optimization penalty and today link spamming is one of the most common forms of SEO suicide. Many times people focus too much on one certain keyword over another and this conducts to an unnatural looking link profile. A normal site shouldn’t have almost 100% of its backlinks with the anchor text “my desired keyword”. The biggest [counter‐intuitive truth about SEO] for me is that “position 1 means more traffic”, we’ve seen time and time again that the difference between 1 and 2 is marginal, in fact position 2 with rich snippets will often outperform position 1. In an ideal world you would want to be number one for everything, but making it the sole focus of your SEO campaign will mean you’re missing out on other opportunities to drive traffic and sales. When Google rolled out the adwords 4 pack we saw significant traffic losses for clients with top 3 positions and gains for those with rankings between 7 – 10 due to the loss of the sidebar ads. Position one would be great but it’s about gaining good visibility across multiple keyword sets and across both paid/organic channels. I think all digital marketers still suffer from a dangerous assumption — that traffic is good. Traffic by itself isn’t good — it costs money and consumes resources. You wouldn’t build a bridge and judge its success by the amount of traffic. You want that bridge to safely and efficiently get people where they want to go. We do keyword research and craft content (especially viral content) around drawing the highest volume of traffic instead of focusing on the right traffic. The “right” traffic doesn’t necessarily mean people who are ready to buy and will convert instantly, but it does mean targeting a relevant audience who is interested in your information, your brand, or your product/service in some way (or could be, when the time is right). Everything else is vanity. The one counterintuitive truth to SEO that we constantly have to teach our clients is that more traffic is not always better. We do a lot of work in Local SEO and often times clients will come to us after a bad experience with another SEO. Upon review, we may find a somewhat spammy link profile that is still flying under the Penguin radar and is picking up traffic from all over the world. How does traffic from Brazil help a Chiropractor in Seattle? As we work the campaign, we may see overall traffic drop by as much as 50%. Most clients only look at the Google Analytics overview page and understandably freak out when they see this. Once we show them how to view the data by geography, they see that the state of Washington is showing a 70% increase YoY and Seattle showing over 50% increase YoY. It always feels weird to deliberately lower traffic. For geographically sensitive businesses it can make sense if it results in more traffic in and around their location. One counterintuitive strategy involves external website links. The conceived notion is to try and shape a website’s PageRank by limiting the number of pages it links. Even further, putting no‐follow tags on certain internal links to try and retain more page authority. In fact, studies show that the opposite is true. Linking out to a couple of quality sites in a relevant neighborhood is a positive thing for SEO. Furthermore, it seems the more you give the more you get. Similar to the real word, the ones that are reaching and engaging more with others are also receiving more site links and citations for improved SEO. At SuperOffice, we’ve grown our blog readership from 0 to 80K readers per month. Up to 70% of this traffic is from search engines and one of the best strategies we’ve used is our external linking strategy. Every claim, quote or study is cited and backed up by their source. This means that in any given blog post, we link out to up to 10–15 external websites. While most SEO’s will tell you to limit the number of websites you link out to, I’ve found the more websites you link to, the higher you will rank! And while you might think that linking out will lower average time on page, we average 4 minutes and 29 seconds on the SuperOffice blog. Search is not a zero‐sum game. When writing a piece of content, webmasters should not be hesitant to link out to complementary resources on third party websites that could help the searcher achieve his or her goal, even if these are competitors. Reading or hearing about PageRank or link juice hoarding practices and more in general crab mentality, drives me nuts. The results of a study last year have shown that linking externally might even help rankings. In my opinion, the presence of outbound links in content is not the cause for ranking improvement, but helping the searcher is, which is measured by other factors considered by Google’s algorithm. Recently, even Google’s Gary Illyes went on a rant about this phenomenon of being fearful to link out during a keynote interview. This should leave no doubt that practicing a generous outbound linking habit is beneficial for our own website, the searcher and the party being linked to. Don’t forget that we prepared an e‐book for you with every great reply we got. In an experiment conducted by Reboot Online, Shai Aharony and his team discovered that websites that link out to credible resources outrank those that don’t. And, that would make sense right? Gives search engines more context about the meaning of your web page through it’s association to other web pages. Increases trust signals through proper attribution of the sources you mention in your content. Improves discoverability and therefore better user experience and for search engines better indexing. Next time you create a piece of content, look for opportunities to link out to credible websites in your niche. Not only is that good karma it’s also good for your rankings. A counterintuitive truth that webmaster need to know about SEO is: SEO is not a customer acquisition strategy for 12 days from now, but a customer acquisition strategy for 12 months from now. I’m talking to real businesses that care about long term, predictable growth. If a webmaster is in desperate need to rank high this month like their business depends on it, they’re knocking on the wrong door. Focusing on the proper long‐term strategy for long‐term growth is how I see successful businesses operate that don’t want flash‐in‐the‐pan results. SEO needs to be built into 12 month plans, then each month needs to be reversed engineered to move towards that goal. You need a aged 10+ year old website to acquire a large amount of organic SEO traffic. The common misconception that a new website cannot do well under 1 year old. After 6–12 months it is possible to do well with an established web property. You just need the right brand metrics, link profile, technical SEO set up, content strategy and ongoing work with the right partners. If someone tells you that they can guarantee instant SEO results, run away as fast as you can. While SEO results don’t have to take an eternity, there’s no getting around the fact that even the best SEO specialist is going to need some time to research your industry and determine the best tactics to use. If you’re curious about how long the process will take for you, here’s a little experiment you can do. Pick a search marketing competitive analysis tool and figure out the SEO traffic value and number of first page keywords for your top 3 competitors. Once you’ve collected those results, do the same for your own site and compare your results. That gap between you and your competitors? That’s not going away overnight. If you’re serious about closing that gap, you’ll need to acknowledge the simple fact that getting on the first page of Google takes time. For years, SEOs have hung on every word of Matt Cutts, John Mueller, Maile Ohye, and plenty of other Google representatives. There’s an odd perception that what these representatives say is gospel. The truth is, though, that statements that come from Googlers are not designed to serve webmasters’ interests, they’re designed to serve Google’s interests. So just because Google representatives say the algorithm behaves in a certain way and not another, or that a given tactic is permissible or impermissible, that does not necessarily mean it’s true. And in many cases, the algorithm is so complex that even official Google representatives can’t fully explain what’s going on in every situation. Software doesn’t always work the way it was designed to work! Take every algorithmic comment Google makes with a grain of salt, and to the extent that you can, test their statements (and your hypotheses) with what you actually see happening in search results. The most important thing when learning SEO is to value your sources, which means listening to the right people. Just as important, which many SEOs fail to grasp, is to NOT to take everything Google says literally — swallowing everything, hook, line and sinker. We all know that there are many types of link building methods that Google has since long banned, which are still efficient. Guest posting, blog comments and directory submissions – which, mind you, were advocated by Google itself in the past, are, as long as they’re done right, still excellent ways of building links. What Google hates and penalizes is poor content and user experience, such as webmasters systematically manipulating PageRank, and thus not providing anything of user value. I think it’s surprising to many folks learning SEO that there is not a single process that works for every page/site/type of content/project. SEO is viewed on the outside as a step‐by‐step process that can be fulfilled for any given keyword or page, but in fact, that process changes for each type of content, each type of site, and each industry because of how engines behave, what opportunities they offer, and how people/organizations in that field operate. SEO is not one‐size‐fits‐all, and that makes it a challenging, complex, but always interesting process. The “case studies” and SEO ranking factor studies out there are insightful, but directional only. Don’t map your plan of action around them. Now SEO is less about applying best practices you read and ranking. Now you have to figure out what search engines want to display at the top of the page and figure out what are the attributes of those sites that push them to the top instead of you. This becomes your gap, and you can create a plan of action to close the gap (instead of a plan of action around SEO best practices). The exception … is that sometimes it’s technical SEO factors that are holding you back, particularly for enterprise‐level websites. These are fairly tried‐and‐true best practices that apply to all sites. Technical SEO is about making sure search engines can access and properly index your site. And the exception to this exception is page speed… where search engines do compare you to everyone else. When you’ve done SEO work for site A, and improved site A with a couple of techniques, nothing guarantees that those same techniques will help site B, C, D, etc. Test and keep on testing. Webmasters still seem to think there is a single tactic or silver bullet that will get their sites to #1 in the SERPs. It requires a wholistic view that encompasses both on page optimization and off page promotion. You can think about that as long form content and getting backlinks. If you have super long form content, it’s helpful and may boost you a few percent, but it’s unlikely that you’ll get a 470% increase in traffic. If you do 15 guest posts, that’s going to be great for your off page SEO. But if you’re trying to rank a 475 word post, that’s not going to cut it. If you try to do a little social promotion, it’s probably not going to move the needle. But if you focus on one element at a time then you’ll be in great shape. Get your on site SEO tight: long form content, silos the content when it makes sense, and get rid of old, obsolete content. Guest post often and don’t forget that you should link to your old guest posts – it’s like White Hat, Tiered link building. And lastly, you need to be patient. It’s not 2009. You can’t rank a site while you take a long lunch! If you have the dedication and if you’re willing to adapt, then you should be able to tackle the on page and off page SEO over time. So remember that ranking a site may take longer than you expect. There are very few categorical “right answers” when it comes to SEO. I find that because SEO is optimizing for a search engine and there are robots and algorithms involved a lot of Webmasters are looking for the unequivocal answer to an equation. In reality “optimizing for search” requires a surprising number of variables from niche‐to‐niche, from site‐to‐site, and even from individual pages, specific queries, and distinct business objectives within a site. For example: it’s become conventional wisdom that long‐form, unique content is more “Google‐friendly” and you should create great long‐form content. I love long‐form content and my company creates a ton of it on our own sites and for clients, but there are also instances (like on authoritative domains and/or sites with larger followings) when targeted shorter form content will actually get you a better return. And conversely, there are instances (with a new site that doesn’t have any sort of domain authority or following) where shorter form content won’t generate any useful organic search traffic at all. Furthermore, because optimizations for search don’t exist in a vacuum, cranking out a content type that helps with rankings and traffic may be an unsound business decision if it drives the wrong type of traffic or if those visitors have the wrong type of interaction with your site once they get there. High expectations from simple best practices can be problematic. “We’ll just change the title tags to match the leading competitor and we’re golden.” “Once we have hreflangs in place our international search results will easily sort themselves out.” It’s usually not that simple, and when webmasters or site owners have high expectations of general best practices they could easily lose faith in SEO when they don’t see instant results. Understand that every site is different, so results are tough to predict until you test things for yourself and see what works and what doesn’t work for any particular page or site. Consider how one typical SEO best practice, let’s say having the keyword at the beginning of the title tag, might perform among the hundreds of algorithm factors already currently affecting that page, that page type, that site, the sites it’s connected to, and the competition in search results for that keyword. All of those things just mentioned will be different for every single page on every single site, and it changes constantly, so the affect that any general SEO best practice may have could be high for one site and have no affect for another. Alternatively, it’s even possible that that specific best practice — having the main keyword at the front of the title tag — could be outperformed by a non‐best practice title tag variation altogether for your pages, if that other variation yields a higher clickthrough rate and longer click. Understand why best practices are recommended, but also keep in mind that you may not know what’s going to work and not work for your own pages until you try it out. SEO is a process, not an event. Many webmasters will attempt to do SEO on their website and “set it, then forget it.” SEO is an ongoing process, as are most websites. Modern day websites are no longer glorified business cards. They are dynamic and ever‐changing entities. In a nutshell: it’s a full‐time job in and of itself. It isn’t something that can be done on a weekend or even a month, it’s something that you need to pay attention to on a daily basis. Do this and you’ll reap the benefits of organic traffic. SEO optimizing the pages on your website is far from static. It´s a living breathing creature. You can´t just “build it” and then forget about it. Once you have created it and optimized it, what do you need to do? You need to feed the SEO creature. And what does it eat? Here´s 3 simple steps to rank on first page of Google. I used a strategy I call The Link Building Tour. I applied massive action… and used blogger outreach to get featured on 158 blogs in 14 months. Want to rank on top of Google? Then you need to constantly feed the SEO beast. SEO is not a “to‐do item” for you to accomplish and then check off of a list. SEO is a mindset and a strategy that needs to inform everything about how you treat your site. From the way you handle images (via effective use of alt text, avoiding placing text in image files, etc. ), to how you choose what kind of content to put on the site, to what words you use to phrase the content you write. SEO must permeate everything about a website. It is not effective to simply patch “SEO” on at the end of the process before moving on to the next thing, it should be there every step of the way. 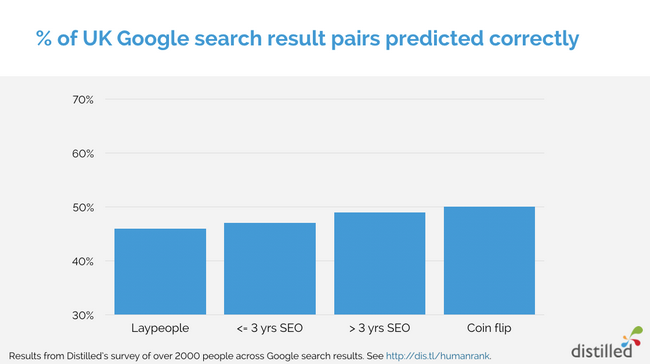 I’d definitely say one of the counter‐intuitive things is that SEO professionals seem to struggle to out‐perform a coin toss at determining which of two web pages ranks high for a given keyword, which I believe is because of the rise of new ranking signals such as those based on user behaviour. We wrote a post about our initial results in this and since then we’ve gathered over 2000 survey responses which show that whilst more experienced SEOs perform better but still aren’t great at this task — even when they can look at whatever metrics they want. I scored exactly 50% on the survey. I presented some of these results in a recent conference presentation as part of my reasoning for why we should be doing more testing in SEO. A counter‐intuitive truth about SEO is that SEO isn’t complicated. Like anything, you can improve and fine‐tune your strategies, but producing content, writing about your product or service in arenas that are frequented by your customers is key. Don’t overthink it. It should simply be a natural extension of your business. The most counter‐intuitive truth about SEO is measuring success. See Taruns full recommendation in our e‐book. Do not neglect the meta. Meta tags get over looked constantly and can kill the click‐through rate of an otherwise optimized post. While Google doesn’t use meta tags for ranking – like the title and description – they are gold mines when it comes actually getting searchers to visit. Make sure the title fits (character count) and includes the keywords (obvious). Remove your site title (if that shows up by default). And then craft a unique and compelling description that includes a close variant of the keywords you’re targeting but previews the hell and heaven of your post. Think of your meta tags as your post’s first impression on search … because that’s exactly what it is. Long‐tail terms can drive sales and leads. All too many time I come across site owners that are fixated on terms with high volume searches. However, while that may be a long‐term goal, in the interim they should be focusing on long‐tail terms. Low competitive long‐tail terms can help drive highly relevant traffic. If you are just focusing on the “big” terms you are essentially holding back your site from driving traffic, especially if your site never ranks well for those highly competitive terms. A lot of webmasters I meet who are somewhat familiar with SEO don’t realize how important it can be to target exceptionally low volume, extremely specific keywords. This is especially true if you’re in the B2B space, where you have to target keywords directed at potential buyers at different points in the buying funnel, and where a keyword that gets five searches a month can result in a deal worth six figures or more. My best advice for this is to scour niche forum boards (or even Quora), talk to your potential clients in person, and even hold focus groups in order to figure out what highly converting long‐tail keywords to target. Five searches or less a month may seem like it’s not worth it, but if that piece of content that’s rarely viewed results in one or two very lucrative deals, then it will have a great ROI. One SEO tactic that webmasters should stop focusing on is strictly using one keyword phrase in the title tag and other main elements on a page. Instead, webmasters should focus on semantic for a keyword topic to build more relevance for the search audience. The semantic keywords can be used throughout all the on‐page elements instead of focusing on one keyword. There are multiple long‐tail keywords that can be used in conjunction with a primary keyword phrase to drive more organic visibility to a page. Optimize for terms that people aren’t searching… then make them search it. I rank for “facebook ads prank” and every variation as a result of this. The one counterintuitive truth is that your target keyword and topic does not need a lot of search volume for you to get a good amount of traffic. A keyword might ‘only’ have 10 searches a month according to AdWords. But there’s often a lot more keywords that match the same intent when looking at long‐tail variations, variations you couldn’t have predicted, or sometimes even growth of interest in that topic. So don’t let a search volume of 10 or less scare you! It’s still worth creating content for, especially if you have a low domain authority and can’t compete with the harder terms. I constantly see the same mistake that many bloggers and website owners keep on making. It is this mistake that leads to bad SEO results. Yes, a lot of people use Google Keyword Planner and pick keywords with high volume. Many pick long‐tail keywords hoping that with them the competition will be less intense. But many forget to evaluate the competition over the keyword they picked. What is the competition over the chosen keyword? What DA/DR (as well as UR/PA) do your competitors have? How many quality backlinks do they have? Who will be linking to your new content? What is the average number of backlinks that your new articles get? It’s essential to correctly evaluate the competition and compare your competitors’ authority against yours. If with the chosen keyword Google displays websites with ratings a few times higher than yours, it means you hardly have any chance. If each in SERP has at least 100 backlinks, but your article averagely gets only about 10 links, you don’t have much chance either. SEOs should not always target short‐tail keywords, but rather focus on targeting juicy mid‐tail and long‐tail keywords. Those might not yield the highest traffic volumes, but will probably return more qualified traffic in the long run. You will have a higher chance to comprehensively satisfy long‐tail searches and therefore make your site a good result in Google’s eyes. In the age of the Google Panda, it’s important to satisfy the user’s search intent. This is a bit counterintuitive to how SEO worked back in the days, where you’d just focus on getting as many users as possible — thus targeting juicy short‐tail keywords — and worrying about filtering out quality traffic later. To prevail in the Google SERPs you have to be a good quality, possibly even the best result — this holds true for all your indexed pages! A clear keyword focus is key! While there are many SEO tips floating around that should be ignored, I’m going to talk about a simple mistake many people still do. With SEO, keyword research is no doubt an important piece of the process. And for many an option is using the Google Adwords Keyword Planner to identify potential keywords to target. Adwords Keyword Planner will show you some suggested keyword phrases, even though search volumes are now a range for most. But the mistake many make (and still do) is that they refer to the “competition” column as SEO competition. The reality is that this column is used to show the competition in relation to how many people are bidding on this keyword phrase. So, if you want to know what your competition is to bid on this phrase, this column will help give you an idea. If you want to know the SEO competition for a keyword phrase, it’s best to use a reputable tool or your own manual analysis. As Google has decreased keyword data available from Keyword Planner and Analytics, some people say “don’t worry about SEO, just create quality content”. However, keywords are still important if you want to get SEO traffic to your website and people need to look for keyword data from other sources, like forums and other keyword tools. I’ve heard people talk about keyword research being dead as a result of Google’s shift to semantic SEO. While it’s true that stuffing your content with a target keyword won’t get you on the first page of Google, keyword research is still the foundation of not just SEO, but Marketing in general. It’s the data driven way to understand what your prospects want so you can deliver that in the form of engaging and satisfying content. It can inform an effective content strategy that has proven demand from your target audience. I think what I’ve noticed is that the world is moving so quickly now that finding keywords simply by using keyword tools is not the most effective method. They will always be backward looking. You now have to listen to social signals and jump on what’s moving in that space. It’s almost better to jump on a trending topic, get in on the discussion and drive a ton of social proof and backlinks that way. Keyword tools have their place but you also have to move into the trending content topics and social discussion to really stand out. I think the biggest myth I hear is that people still think there is some secret “perfect number of keywords” percentage every article or blog post must have. This forces bloggers and other content creators to write for the search engines. Instead, they should be focused on writing for their audience and the keywords will flow naturally. One great way to get a natural flow of keywords is to transcribe audio interviews with experts in your field. The keywords used by your audience (and ranked by the search engines) will flow naturally in the conversation. The best way to get ranked in the search engines without having to worry about a “Google‐slap” is to do what’s best for the reader. Stop focusing on the “hot new” gossip about what Google likes and think long‐term. That means writing (or transcribing) long‐form articles that give the reader value. The good ranking will naturally follow. The #1 counter‐intuitive truth about SEO is that you should optimize your blog posts for multiple keywords. We’ve been taught to optimize our content for only one keyword. If we focused on multiple keywords in our content or wrote another similar blog post just so we could rank for a keyword, it would make it difficult for Google to know which keyword we were trying to rank for in search. It could also lead to a messy and complicated post that was too long and confusing for readers. The truth is, it is ok to optimize your blog posts for multiple keywords. Not only would you have a main keyword you were trying to rank for, but you can also includes synonyms or related keywords. By optimizing your content for multiple keywords, not only can you rank for your main keyword, but because you used synonyms or other related keywords, you have a chance to pick‐up traffic for the additional focus keywords that you used! One thing I see businesses & SEO companies doing all the time is obsessing over one particular keyword. Let’s say they are a dentist in Chicago and they want to rank for “dentist chicago”. To achieve this, they smother their entire website with tons of instances of “dentist Chicago” including putting it in multiple pages’ title tags, the footer, H1 tags etc. What ends up happening is Google is confused on what page to actually index and rank so they often rank the homepage for that term and then filter all the other pages since they are similar. Instead of strengthening their ranking, all the site is really doing is creating more content to compete with themselves. They also miss out on the opportunity to rank their other pages for different keywords that could also bring in traffic and business. A big rule for me is to never make multiple pages on the same site compete for the same keywords. SEO is all about relationships. While it started over twenty years ago being practiced by the darker‐hatted webmasters of the world using tricks to rank higher, the SEO of today is driven by reputable links from authoritative websites. These links can’t be gained in a sustainable way without solid relationships. The best SEO is long term SEO that drives your business for years to come, so sustainable SEO is full of relationships with those who own or write for sites within your business’s niche. One of the more important things that webmasters and site owners overlook in their quest for internet dominance is building relationships with others in their niche. Oftentimes we look at others in our fields strictly as competitors and overlook great opportunities for maximizing each other’s work. This is a huge mistake! Instead webmasters and site owners should look to build valuable relationships to strengthen each other’s web presence. This in fact, has been a major driving force on why my real estate site has become so successful. Of course you need quality content — that goes without saying. Building meaningful relationships with others in my field, however, has taken my business to new levels. Webmasters should never overlook opportunities in SEO or content marketing with others in their field. When the opportunity presents itself, dive right in and building something of mutual benefit. Something that I have realised lately, that myself and many others are blind to, is that “you need to embrace your competition and not fear them” — in SEO, as well as in most things online. What do I actually mean by this in reality? Well, I am guessing that you check out your competition to see where they are getting links, what content they are posting, what keywords they are using, and so on. Great idea. (if you are not doing this yet, start‐ NOW!). But what about getting to know, and collaborating with your competition on almost those very same things. Of course, you don’t want to tread on each others toes and steal each other’s rankings, but why not work together to achieve your goals. The web is a dog eat dog kinda place, and the more friends or allies you can get the better. So next time you cringe when you see your competition trying to “borrow your keywords” why not write them an email and see how you can help each other! The #1 Counter‐Intuitive Truth That Webmasters Need To Know is that your website is a conversation piece. Most webmasters think that SEO is about updating content regularly with keyword rich copy. That’s only half the story. That content needs to actually be compelling and useful and contain links to other content you’ve already created elsewhere on your site as well as links to relevant content outside of your website. If you think of your website as a multi‐speaker conversation with your audience listening and participating, then you’re closer to the truth in SEO. I’d say most people are obsessed with what simply gets the most searches and looks doable to rank well for — but that may not be the best approach for your particular goal. You need to think like your prospective reader to find the ultimate best terms. But my strong sense is that prospects search for a ‘freelance writer,’ not for ‘freelance writing.’ People searching on ‘freelance writing’ related terms may well be freelance writers themselves! But prospects tend to search for the noun they want — the person. They search “freelance healthcare writer” or “Seattle freelance writer” or something similar. So using ‘freelance writer’ would probably find a writer more prospects. There may be fewer searches, but that is more likely the search their prospects are doing. It pays to ask clients how they found you and learn more about how they search to discover the most useful terms to go after. I think the #1 counter‐intuitive truth is “Bigger Isn’t Better”. It seems like SEOs have had to learn this the hard way over the years. First we learned that more keywords wasn’t better (keyword stuffing). We then learned that more pages wasn’t better (doorways). We went on to learn that more links weren’t always better (spam), more content wasn’t always better (page speed), more shares or links weren’t better, and now we are learning that more data isn’t necessarily better (if it isn’t reliable or fresh). Many webmasters recommend blog posts should have around 1,500–3,000 words (preferably more.) It’s true that studies have shown that longer copy often positions better and gets higher average shares. Plus, depending on the phrase’s competitiveness, competing content and other factors, writing a long‐in‐depth post may be the smart choice. However, Steve Rayson from BuzzSumo has also found the top most shared content is short‐form content(under 1,000 words). Additionally, short‐form content may be the perfect length to answer a long‐tail, micro‐moment query. After all, in many cases, you don’t need 2,500 words to answer a “how‐to” query. Nor, will many readers want to slog through 2,500 words when what they want is a quick answer. My advice: yes, take the SEO/positioning/sharing ramifications into account, but always focus on your target reader. That may mean your average blog word count is 1,000 words, with the occasional piece of in‐depth content. That’s OK. If the copy is positioning, driving traffic and engagement — plus, your content is quality and provides useful information — you’ve done your job. In my opinion, the #1 counter‐intuitive truth is that implementing the use of targeted keywords wherever you can will not work. One may think to use a keyword on their website as much as possible, on as many pages, to try and rank higher for that keyword. Doing this poses two problems: keyword cannibalization, and what I call Google’s “suspicious” spiders. If I have a keyword that I try to use on multiple pages on my website, like both product pages and homepage, those two pages will be competing for each other in SERP rankings and “cannibalize” each either. To counter‐act this, make sure each keyword is tied to one relevant page that’s highest in the site architecture (in this case, the home page). If it’s necessary for the keyword to be on multiple pages, you can implement a robots.txt in the code of the page that’s lower in the architecture, which will exclude the lower page from SERPs and prevent cannibalization. Additionally, using keywords an excessive amount is a big red flag to Google’s “spiders”, which crawl and index webpages for SERPs. There’s no hard and fast number/rule when it comes to keyword overuse, however if the use of a keyword begins to affect the readability and user experience of a page, that’s a good sign you’re overusing it. Less is More — Google loves long‐form content, yet webmasters and content creators continue to churn out shorter form content in the name of quantity. We’ve tried both and we’ve seen that one 5000 word post attract far more organic traffic over time than five 1000 word posts. One counter‐intuitive truth that’s good for SEO, based on my experience, is that buying quality traffic can help SEO. I’ve noticed over the years that to posts I buy traffic to, they often start ranking pretty well over time. I’m not saying buying traffic guarantees ranking, nor that you should do it for every piece of content. However, if you have funds to invest in content that performs well financially, buying traffic is not only good for direct revenue but long term rankings. The #1 counter‐intuitive truth that other webmasters should know about SEO is that “search engine” is not limited to Google. You can find full Phil’s answer in this e‐book. I’ll talk about YouTube SEO. Most people think that if you want to rank highly in YouTube and Google search, you need massive backlinks. The truth is, YouTube has no luxury for backlinks. What they value is how people interact with it. So, from my own experience, creating longer videos that can hold someone’s attention for 5+ minutes is the #1 counter‐intuitive truth that other webmasters should know about SEO. And if any webmaster is serious about ranking theirvideo in YouTube and Google search, then they need to create longer videos (5+). Longer videos that hold someone’s attention for 5+ minutes have an edge over shorter videos in YouTube and Google search. For example, if you search in YouTube for the keyword “Content Marketing”, 3 out of the 5 top videos are more than 5+ minutes. So in every video you create, aim for longer videos that’ll hook your readers and make them engaged. And there is no doubt you’ll get more traffic. Often your best weapons are right under your nose. Don’t hold a funeral for your dying articles just because they’re not performing anymore. For a quick‐win, edit and enhance legacy content, update its key information, add fresh quotes, unique insights, and new imagery, and update to reflect a recent publication date. It’s a well‐known truth that webmasters should refrain from deleting old content, but by taking this a step further and actively improving it, you can see significant search traffic results — not to mention increased social media impact. This fits into a wider re‐purposing strategy, whereby brands should make their content work hard for itself, rather than starting from scratch with every topic, theme, or campaign. Many marketers might avoid international SEO since they think there are too many technical and language requirements. This myth is guided by every international SEO guide which begins with a tutorial on whether to set up a global SEO with a subdomain, ccTLD or subdirectory. The guides then follow up with tips on how to set up a website with rel=”alternate” and hreflang=”x” annotations which helps Google understand similar but translated pieces of content. In fact, you can dip your toe into the world of international SEO without creating any new domains, subdomains or even subdirectories. You don’t even need to translate full pieces of content. You can start by simply building pages that target other countries by using localized keywords and references. For instance, if you are an American website targeting France, you can write dates, currency and examples that would resonate with a French audience. You can also use a handful of French keywords within your English text that would help clarify your products. With a bit of outreach in the French market, you will begin to see an uptick in French traffic. If your slightly targeted content begins to resonate in markets outside your native location, you now have a solid proof of concept to iterate against and justify larger investments that might end up with a unique domain or at least a subdirectory. Did these misconceptions and intuitive SEO tactics sound familiar to you? Do you agree with the counterintuitive truths shared? I really hope this article and the bonus e‐book will help you with your SEO work. If you’ve got more counterintuitive truths about SEO to share, the comments section is all yours!